Canada is failing to meet federal flu vaccination goals as Canadians continue to balk at rolling up their sleeves. Just 38 per cent of Canadians were vaccinated during last year's flu season, according to an internal Public Health Agency of Canada report obtained under Access to Information laws. "Too few," noted the report's author. While the vaccination programs themselves fall under provincial jurisdiction, the Public Health Agency promotes the vaccinations nationally and monitors the spread of flu and flu-like illnesses. The agency hired the research firm Léger to ask Canadians in early 2018 whether they had received the shot or spray — and if not, why not. The results were then shared in multiple internal reports. The number of Canadians reporting vaccinations has basically flatlined since 2015, the first year the agency started surveying Canadians. At the time, 34.3 per cent of Canadians said they had been vaccinated. Most respondents said they didn't get the shot because they didn't think they needed one, or they believe it doesn't work. "Recent reports in the media regarding the low effectiveness of the influenza vaccine can be contributing to this belief," says the agency's analysis. Dr. Howard Njoo, deputy chief public health officer at the Public Health Agency of Canada, said they're looking into why so many people aren't getting the shot. "We recognize people have busy lives," he said. "And if there's anything that we can do systematically, from a program delivery point of view at a local level, to make it easier for people to get the flu vaccine, to take time out of their busy schedules, I think that that's certainly something that's encouraged. "Even if you don't think that you personally are at risk, it's important to get the flu vaccine because you can also protect your loved ones, those who might be at a higher risk because of chronic diseases." 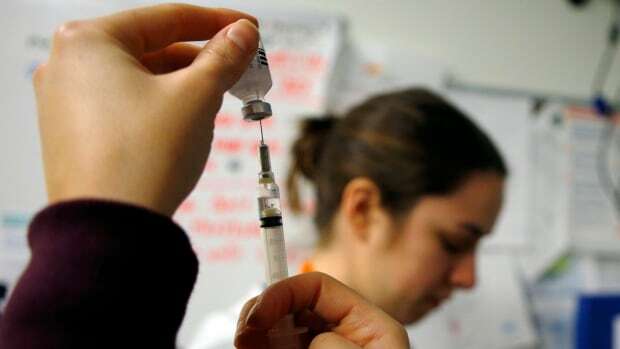 According to the report, the agency set a goal of getting 80 per cent of high-risk Canadians vaccinated, but fell short. Just 39 per cent of adults with chronic medical diseases bothered with the shot. The health agency also zoomed in on some of the survey data to get a sense of how many young children are getting the flu shot. Kids under the age of five face a higher risk of getting sick. The report showed the majority (63 per cent ) of children aged six to 59 months in surveyed households were not vaccinated. Again, when asked why, parents said they didn't think the vaccination was needed. On the positive side, about 71 per cent of seniors — another one of the health agency's targeted high risk groups — were vaccinated last winter, getting the closest to the set target. "We recognize that we have to be realistic," said Njoo. "And so if we aim for this [80 per cent] coverage goal for these three main groups, then over time I think as those coverage rates improve then, just by sort a spillover effect, it will also improve rates overall for the general population. "Obviously, it would be good if everyone were able to, you know, get that kind of coverage." On average, says the agency, the flu sends 12,200 Canadians to hospital and kills 3,500 a year — "an underappreciated contributor to mortality."